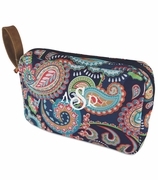 Monogram leopard make up cosmetic bag. Sophisticated, stylish and classy! This bag embodies all those features. It is elegantly adorned with a solid black color block center and trimmed in a rust and black bottom band and trim. This animal print pattern is a classic staple in fashion. The neat compact shape makes it perfect for storing cosmetics and it will fit easily into a bigger suitcase or handbag. 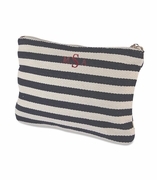 The bag features a simple rectangular design with a zip closure running along the top. Use it when you travel or to take cosmetics to the office. Add a matching duffle or tote bag for traveling. 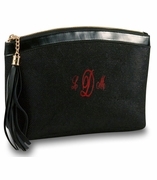 Personalization is always available and included with purchase from Simply Bags. Embroidered make up cosmetic bag measures 9"W x 7"H x 2.5" across bottom. Nylon lined, zipper closure.